LiveRez CEO Tracy Lotz with Idaho Governor C.L. "Butch" Otter at the 2014 Partner Conference in Boise. 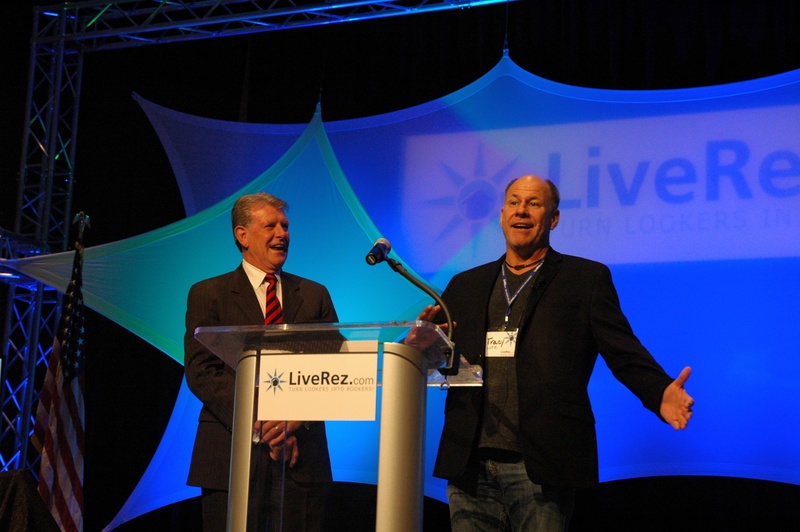 The 2015 LiveRez Partner Conference will run Oct. 19-23 in Sun Valley, ID. Eagle, ID – LiveRez.com, the most widely used cloud-based software for professional vacation rental managers, today announced additional details for their 2015 Partner Conference to be held October 19-23 at the historic Sun Valley Lodge in Sun Valley, Idaho. The conference is expected to draw more than 400 attendees from all across the United States and abroad. “The Sun Valley Resort is the perfect destination for a conference of this caliber and represents a homecoming for our company,” said Tracy Lotz, CEO of LiveRez. The company was founded in nearby Hailey, Idaho and is now headquartered outside of Boise. Tuesday’s keynote will be Marcus Luttrell, decorated Navy SEAL and New York Times best selling author of “Lone Survivor.” Luttrell is one of the most sought after speakers in the country, having delivered his inspirational account to hundreds of groups around the country. The Wednesday keynote will be Shaun Stewart, Head of Global Vacation Rentals at Airbnb. The Cornell grad is a rising star in the hospitality industry and previously held senior roles at Expedia, TripAdvisor, Travelscape and Jetsetter. Airbnb is one of the hottest tech start-ups in the world, with a recent valuation of $25 billion. “We are thrilled that Marcus Luttrell and Shaun Stewart will be our keynote speakers. This is going to be an unforgettable week of events,” Lotz said. Lotz also announced the Platinum Sponsors for the conference, which are CSA Travel Protection and VacationRentPayment. Based in San Diego, CSA Travel Protection is a leading provider of travel insurance and emergency services. Located in Walnut Creek, California, VacationRentPayment is one of the leading payment solutions for the vacation rental industry. ←Airbnb’s Shaun Stewart to Keynote Partner Conference!